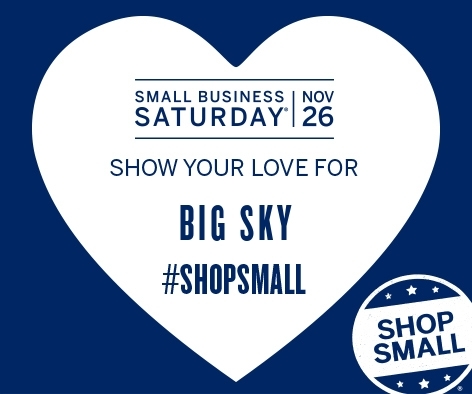 The Big Sky Chamber of Commerce is helping the Big Sky community “Shop Small” on Saturday, November 26th as a part of the American Express nation-wide Small Business Saturday event. The purpose of the event is to encourage locals to get out and support local businesses in an effort to Shop Small. Shoppers will meet at the Chamber between 9:00 a.m. and 10:00 a.m. for coffee and mimosas to kick off the celebration, and to enter for a chance to win one of four $50 gift certificates to spend on Shop Small Saturday at any of our participating local businesses. The Chamber will also be putting together a listing of local business’ Shop Small Specials as a guide for shoppers. To ensure your business is a part of this great event, contact the Chamber today at info@bigskychamber.com or (406) 995-3000. CLICK HERE for a list of this year's participating businesses and their specials.